June 2013: To boost the geek factor a notch, there’s nothing like a late night video-chat from London to Eric Norrell at Telestream in sunny SoCal. Eric is a desktop specialist and all-around web broadcasting pro. He’s going to give us a brief training session on the use of a virtual camera. While we’re staring cross-eyed at three different platforms necessary to make TimeWave happen, Eric is cool as an iceberg pre-climate change (no meltdown in sight). To stream in remote pieces from Spain or the U.S., the process is straightforward. The minute you start using telepresence in which two locations are contributing to one play at the same time, it gets tricky. You have to use three applications – telepresence platform, live video editing application and web broadcasting platform. 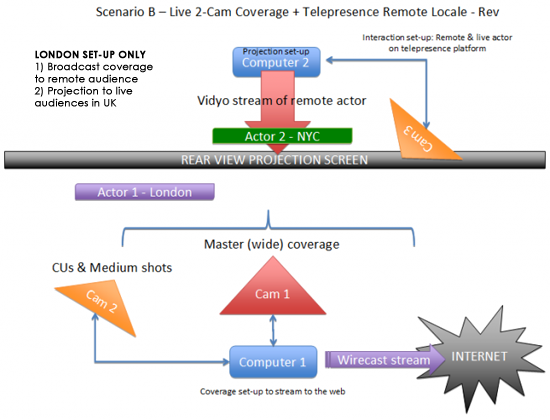 The stream from the telepresence platform feeds into the live video editing software, which then pipes the composite stream into the Internet broadcasting platform. It’s supposed to be “live,” right? The next stage in the development of these applications will be full integration, so the platforms speak to each other and the process becomes coordinated and fluid. At the moment, they were built for different reasons. We have to figure out ways to knit these applications together. In some respects, it’s a reverb back to shoe strings and sealing wax. Ask any old-time physicist and you’re bound to hear – sometimes strings and wax are all it takes to get something to work. As long as it works, what’s to fret? The next challenge is to figure out how to give remote actors “eyes and ears” so they can see and hear London actors in telepresence pieces. We have to train a camera on London actors so, for example, a New York actor isn’t left in the twilight zone with no visual or sound cues. The London actor and the remote actor need their own separate telepresence stream in which they can respond to each other. We capture and project only the remote actor to the London audience or they’d see a double – a ghost! – of the London actor on the projection screen. Just a wee glitch that has to be ironed out – oi! In some of the pieces, remote actors can stream right into the telepresence platform with iPads and iPhones. Actors don’t even need a laptop/computer. All they need is an Internet connection and they’re streaming into London and projected to a live audience in real time. The concept of a defined physical space for theatre becomes obsolete. Once urban areas are blanketed with superfast WiFi, entire geographic landscapes become wired for theatre and performance. In a sense, this hybrid theatre/cinema medium becomes more similar to a film except the camera is wrapped in the actor’s hand.